Pumped BMX Pro is a fast-paced arcade BMX trickathon from Yeah Us!, Warp Digital Entertainment. Master 60 levels and over 200 challenges while pulling off as many radical stunts as possible on one of 15 bikes. Chaining massive combos could put you at the number one spot on the global leaderboards. Pump your way through 60 levels of ever increasing difficulty, making sure you’re racking up those platinum medals by completing Trick Challenges along the way. Choose from 15 riders with predesigned bikes, or get creative and design your own in the easy to use bike designer. 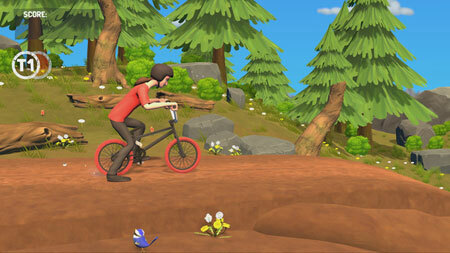 The game features 15 characters, each with their own spectacular bike. There are 6- beautifully designed levels, from high top mountains to swampy depths. Try over 200 challenges, each is harder than the last. Make more than 40 radical tricks, from outrageous spins to insane grinds. If you get stuck in the game, check out the video walkthrough and gameplay for the game. This entry was posted in PC Games, Walkthrough and tagged Pumped BMX Pro Cheats, Pumped BMX Pro Gameplay, Pumped BMX Pro Guide, Pumped BMX Pro Strategy, Pumped BMX Pro Walkthrough by Marvin. Bookmark the permalink.